just me and my mary janes: Are you here for the Prima NSD Blog Hop? Thank you so much for your great video tutorial. Just love the stamped flowers! I should definitely have to use my inks more often too and you inspired me to do so:) Have a happy scrapbook day! Great tutorial Cari! I hope you have a BEAUTIFUL (LOL) and fun filled National Scrapbooking Day! Cari I love the video. I would never of thought to use ink on them like that. Great technique. looks like Im first! I loved the video, the blues were soooo pretty on that canvas and that stamp was amazing design also. thanks for taking the extra time to make a video for this hop I really enjoyed the technique and it was new to me!! Thanks for the technique video. WOW what a great video tutorial! I just love this blue stamped flowers! Have a nice SCRAPBOOKING DAY! Enjoyed your video, thank you! It's Mother's Day here tomorrow, I don't know if it is for you or not, but have a "beautiful" day regardless! Loved the technique video! Thank you for the chance to win some Prima goodies. Happy NSD! Thanks for a great tutorial!! Love the large flowers! And thanks for the inspiration! Cari, that was a lovely video tutorial. I love that watercolour look... and on a canvas cover too! That has inspired me to use my distress inks more often! A pleasure to "meet you", tight at the end of all that blog hopping! Thank you so much for sharing, I have never seen those techniques before, you made my day! Great tutorail Cari loved it. They where both Beautiful. Have great and Beautiful day. Can't wait to meet you. What a great tutorial, i still have 2 of these beautiful stamps and now i know i want to use them again. I loved the look on the canvas.Thanks! Thankyou for sharing this technique. One I'm definitley going to try. It looked awesome on the canvas. 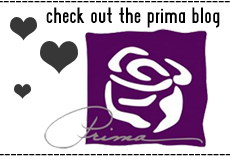 Thanks for the Beautiful opportunity to win some prima goodies! Awesome video and thanks for the chance at more blog candy. Thanks for the tutorial Cari! What a fantastic idea at the end of this great blog hop! My daughter sat with me and watched everything with her keen 5 year old eyes! "do you have that stuff mom?" ...lol! I have to keep close eye on my stash with such a creative flair that she has :) Thanks again! Happy NSD! Great Idea Cari, I have that Hollyhock stamp and I'm going to use it with the inks.. Love, Love Prima and Happy Scrappy Weekend to all!!! I love your work, it is always spectacular and thanks for a great tutorial... love the water mist on canvas before stamping... will be using that one! Thank you for your great tutorial!!! I would love to see what you do with the stamped paper :) You have enspired me to get messy with my stamps and inks......thank you for the chance to win! Great tutorial and I love the stamped flowers! I like the look of stamping in a project but I admit it intimidates me a bit. Your video makes it look easier than I thought so I may have to give it a go. Thank you and Happy National Scrapbooking Day and a wonderful Mother's Day!!! Love this technique! Thanks for a chance to win the Prima goodies! I loved how you used the pearl mist to wet the distress inks and the watercolor effect you created. First time I've seen these oversize stamps..shopping trip :)Thank you for sharing. Such creativity! Don't you love Distress Inks?! Thank you for the inspiration! Beautiful flowers ! Thanks for tutorial. The video tutorial has inspired my creativity to be kick-started. I love to paint and have just started stamping. Wow, what an amazing and BEAUTIFUL technique. Thank you so much. Happy to be a new follower! Feel free to follow back if you'd like. HI HI HI...Love your tutorial on stamping, esp loved it on the canvas, Im going hto have to try that! Thanks for the opportunity to win some prima also!!! OMG!!!! I LOVE LOVE LOVE those flower stamps!!! I am so glad I hopped by and saw them. Thank You! Loved the video. You made the stamped flowers so dimensional and beautifully watercolored. Those large stamps are great. Happy National Scrapbook Day. Happy Scrapbook Day from New Zealand. Thanks for sharing. I shall visit again. What a fabulous video! I need to find myself some of those stamps now! :) I love love love how you used the first stamp on the scrapbook page, and the stamping on the canvas is just gorgeous. Happy NSD and Mother's Day! 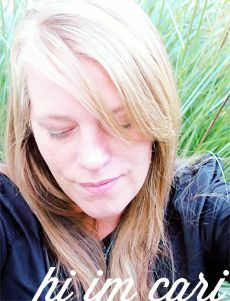 hi cari, thankd for the tutorial, it was "beautiful"
would love to win some of that prima goodness!! Great video! Thanks for sharing this technique. Can't wait to give it a try! Thanks for showing a great tutorial, I just love techniques like that. It looks like you have an awesome selection of Prima flowers that you are giving away to some lucky person. Hope you have a great Scrapbooking day. Thanks for sharring the video.And i love the flowers one the canvas. Great tutorial - thanks! I have always used paint on my foam stamps - So great to see them used with the distress inks. Yay off to play!! Great tutorial and cool stamps! Thanks for the yummy giveaway! Your work is amazing! I am super rapped that the last hop ended with you and a awesome tutorial, what a fab way to end my International scrapbook day! That was a great tutorial. Thanks for sharing. I love the stamps! Cari, Thanks so much for sharing and for the chance to win extra goodies! Always enjoy your ideas. Great video, I love the way you misted the flowers again after stamping to get the colours to blend and pop! Oh wow!! I love this technique. I guess I need these stamps too. LOL I think you are an enabler!! What a beautiful giveaway also!! Wow what a great idea to use the inks on the stamps that way. Loved the blue flowers. Will have to try them. Thank you very much for a beautiful video. Wonderful techniques Cari!! I am in love with those stamps. Beautiful work!! Super enoyable video!! Loved the long-stemmed flower stamp on cardstock, and the tip about Perfect Pearls spray! Very satisfying end the blog hop. Thank you! Thank you for the neat tutorial. I will have to give that a try. I'm new to this and have not tried the misting technique. Thank you. Thank you so much for sharing these ideas. I am inspired! THANKS for the wonderful tutorial! It was very helpful, I loved it! I'm a new follower on your blog as well. Thanks so much for a chance to win the BEAUTIFUL products!!! Really enjoyed your tutorial. The products look like they are fun to use. Thanks so much! Great blog hop! 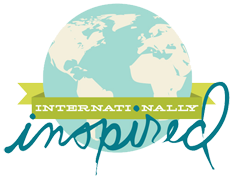 Happy Intl Scrapbooking Day to all! Great tutorial. Love Those stamps! And big thank you for offering a chance to win even more goodies. Happy Mothers Day Cari! Great tutorial Cari, thanks so much. I've not seen the irridenscent sprays here in the UK, they look good so I'll definitely look out for them. Fantastic tutorial!! I am very inspired. What an amazing give-away too! Cari I loved the video! It's like I get to catch up with you :) Your hair is getting long girl! Ok...I wasn't a fan of those foam stamps but you just made me wanna go pick some up now. I had no idea that paired with patterned paper would create such a beautiful look! Happy NSD!!! Great tutorial. I loved the stamped image on the canvas! Thanks for taking the time to put the tut together! Love the video tutorial! I want to know what that flower stamp is- those are great for a page. Great video! Thank you for the new technique idea! Thanks for the tutorial. Love he ideas. Thanks for he chance to win some goodies. Happy NSD! :( so all those goodies are new to me! Thanks for sharing your talents and offering goodies. Cari, thanks for the tutorial I will need to buy one of those stamps they are beautiful!!! Oh...forgot to tell you...I am now a follower, and I think I need to go find that flower stamp! You made me want it!!! LOL...Along with your little prize pack of flowers, of course!!! Thanks for the extra chance!! Great video, Cari. Thanks for the tutorial. I'll definitely try that. Cari, I love your videos!!!! Thank you so much. Hi Cari, thanks so much for the wonderful tutorial. I never tried that technique before (with the mister spray) - that is very cool! What a great tutorial - thanks so much! Oh, it is the first time that I see your blog and I found that amazing techniques that I will for sure try as soon as I go back home today! Best regards from Spain! Hope I'm not too late for the giveaway. Loved your video, thank you, I am now following you. Your tutorial is awesome!! I will have to try that technique. Thank you so much for sharing your beautiful work! Cari, what a great technique... I am definitely going to try this out. I will have to get some of the pearl mist you used! Great tutorial and now I am all inspired to try this! It looks terrific! Thank you! Cari! I LOVED that tutorial. Thanks so much for the inspiration. It's so great to SEE things. It makes it come alive to me, and it feels like I'm with you when you do it. Then I'm inspired to try it. That's what I'm about to do now... Go and try it. Thanks girl. You are AWESOME. And I'm off to follow you! Loved your tutorial, many thanks for sharing, am really inspirated to go off to create. I love the video. I would never of thought to use ink on them like that. Great technique.!!! !